We still have a lot to cover is there moto for this event. Below is a summary of everything they announced today. There are tags in the Finder and improvements to multiple-display support. New Maps and iBooks apps. OS X MAVERICS IS FREE!!! Haswell chip inside the new ones, with Intel Iris graphics. Up to 90 percent faster than the last generation. Up to nine hours of battery life. The flash storage is 60 percent faster with 802.11ac WiFi as well. There’s a Thunderbolt 2 port. This next gen starts at $1,299, $200 cheaper than the last gen.
2.4GHz dual-core i5, 4GB of DRAM on that base level. The 15-inch Pro is powered by an Intel Crystalwell chip, with Iris Pro graphics. 15-inch, 2.0GHz quad-core i7, 8GB memory, Iris Pro Graphics, 256GB storage, shipping today. Starts at $1999, down from $2199. 8 Hours of battery life, up from 7 hours. Faster Wi-Fi, Thunderbolt 2, PCIe-based Flash. Storage is all flash based at up to 1TB. It’s also user accessible, so you can get right in there. You can expand things via Thunderbolt 2. 70% more energy efficient than previous generation. There are new versions of iMovie, iPhoto and Garage Band for Mavericks and iOS. They’re all 64-bit and work with iCloud. You can change speed on the video and do picture in picture on iOS devices. There’s a new, cleaner design on the Mac, as well. iMovie Theater. You can watch all of your videos in a single place — and its available across all devices and Apple TV through iCloud. New feature in GarageBand called “Drummer”. Plays along with you, but takes your directions. You can buy additional drummers through in-app purchases. All of these will be free with the purchase of a new Mac or iOS device. And they’re all available today. Pages, Numbers and Keynote have been redesigned for iOS 7 and rewritten for the desktop. There’s a 9.7 inch retina display with a smaller bezel than ever. 43 percent thinner. The device itself is 7.5 mm thin — 20 percent thinner than the last generation. Weighs just 1lb. .4lb lighter than last generation. Same A7 Chip as the iPhone 5S with 64 bit support and M7 motion coprocessor. 8x faster than the first iPad and graphics are 72% faster. First IOS device with MIMO wireless (multi in, multi out). 5MP iSight camera, a 1080p HD video camera and dual mics. It starts at $499, replacing the last-gen iPad. It comes in silver, white, gray and black. NO GOLD. 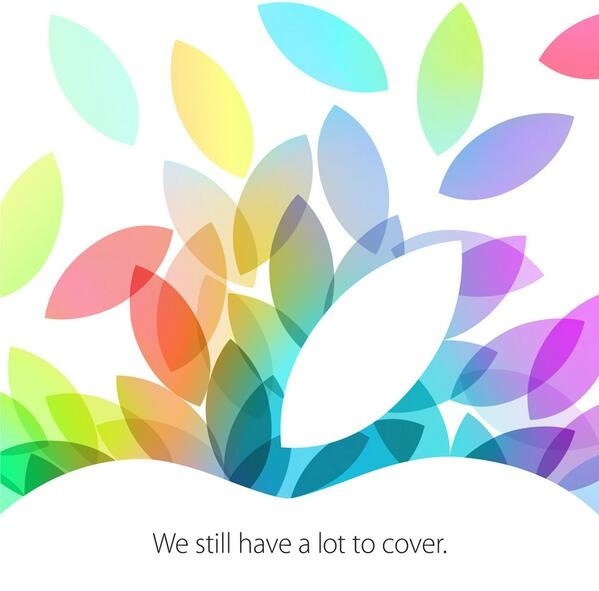 iPad Air is shipping November 1st. Finally gets a Retina display! A7 chip inside, making the CPU up to 4x faster and graphics up to 8x faster. It’s got 10 hours of battery life, MIMO and a 5MP camera. priced at $399, later in November. Current iPad mini will drop to $299. Multiple case options as usual.